Alright. So we're going to talk about hydrocarbons. Hydrocarbons are the simplest organic compounds which contain only carbon and hydrogen. And the reason I boxed off organic compounds is because we've been dealing with thus far, inorganic compounds. In Chem 1 you're dealing with inorganic stuff. Now we're going to talk about organic stuff. And organic Chemistry is the Chemistry dealing with carbon, the atom of carbon. And the reason you might wonder, why is it that carbon is has a whole range of Chemistry just dedicated to itself? Well, carbon is actually very easily bonded to itself and other atoms around it. Hydrogen being something that it bonds to readily and oxygen and nitrogen and things like that. And because they bind it binds covalently with those things around it, quite often there's actually thousands upon thousands upon thousands of Chemistry containing, sorry, carbon containing compounds within in our world. So you're dealing with like medicine haves tons of carbon containing compounds, plastics or all carbon containing compounds, our body is made up of carbon. So you have to have, you have to dedicate a whole branch of Chemistry just to this atom itself. 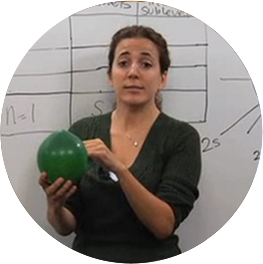 So let's talk about how it bonds and what kind of compounds you can actually make using carbon. So we know carbon has four valence electrons, which means it's going to form four bonds to get the total to eight valence electrons that it needs. Hydrogen which it typically bonds with you'll see most often has one valence electron and only forms one bond because it only needs two valence electrons. So the simplest organic compound or hydrocarbon you're actually going to see, is methane which is CH4. One carbon bonded to four hydrogens. So [IB] many many many different types of hydrocarbons you're going to come across and they're going to be called "carbon chains," or something along those line and one of the first things you're going to see are things called alkanes. 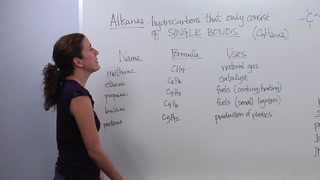 And alkanes are all singly bonded to other carbons. So everything within the carbon chain's all single bonded. So a basic structure for a basic formula to determine the formula for a hydro- sorry, an alkane would be CNH2N+2. So here I have a hydrocarbon chain an alkane chain written up here for you and it has four carbons. Okay. And so according to our formula it's the number.